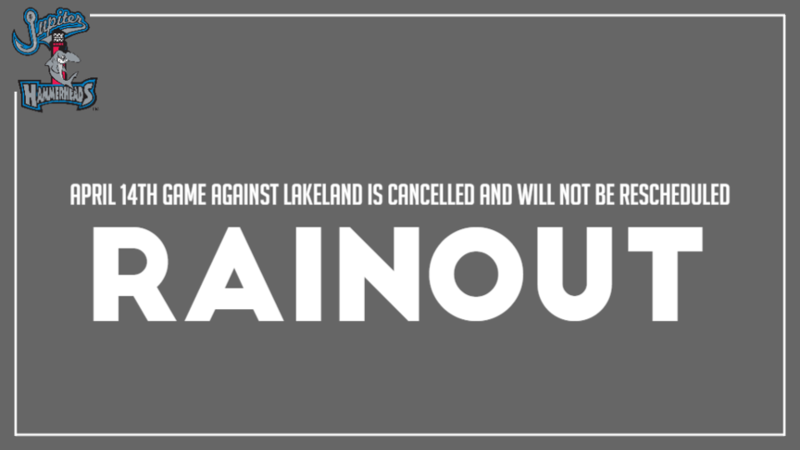 The Jupiter Hammerheads game against Lakeland on April 14th was cancelled due to inclement weather. The game will not be rescheduled. In the case of a postponement or cancellation due to rain of a Florida State League game, guests may bring their ticket stubs to the ticket window and exchange them for any other game that season, excluding July 3rd and 4th and the All-Star Game on June 15th. No refunds will be issued. For Group Ticket refunds, Roger Dean Chevrolet Stadium will work directly with the respective group leaders and handle refunds accordingly. Group tickets will not be allowed to be exchanged at the Roger Dean Chevrolet Stadium Box Office. Please contact your group leader for more information.